The rename stage maps the ISA (or logical) register specifiers of each instruction to physical register specifiers. Renaming is a technique to rename the ISA (or logical) register specifiers in an instruction by mapping them to a new space of physical registers. The goal to register renaming is to break the output- (WAW) and anti-dependences (WAR) between instructions, leaving only the true dependences (RAW). Said again, but in architectural terminology, register renaming eliminates write-after-write (WAW) and write-after-read (WAR) hazards, which are artifacts introduced by a) only having a limited number of ISA registers to use as specifiers and b) loops, which by their very nature will use the same register specifiers on every loop iteration. Fig. 5.2 The Rename Stage. Logical register specifiers read the Map Table to get their physical specifier. For superscalar rename, any changes to the Map Tables must be bypassed to dependent instructions. The physical source specifiers can then read the Busy Table. The Stale specifier is used to track which physical register will be freed when the instruction later commits. P0 in the Physical Register File is always 0. The Rename Map Table holds the speculative mappings from ISA registers to physical registers. Each branch gets its own copy of the rename Map Table. On a branch mispredict, the Map Table can be reset instantly from the mispredicting branch’s copy of the Map Table. As the RV64G ISA uses fixed locations of the register specifiers (and no implicit register specifiers), the Map Table can be read before the instruction is decoded! And hence the Decode and Rename stages can be combined. An additional, optional “Committed Map Table” holds the rename map for the committed architectural state. If enabled, this allows single-cycle reset of the pipeline during flushes and exceptions (the current map table is reset to the committed Map Table). Otherwise, pipeline flushes require multiple cycles to “unwind” the ROB to write back in the rename state at the commit point, one ROB row per cycle. The Busy Table tracks the readiness status of each physical register. If all physical operands are ready, the instruction will be ready to be issued. The Free List tracks the physical registers that are currently un-used and is used to allocate new physical registers to instructions passing through the Rename stage. 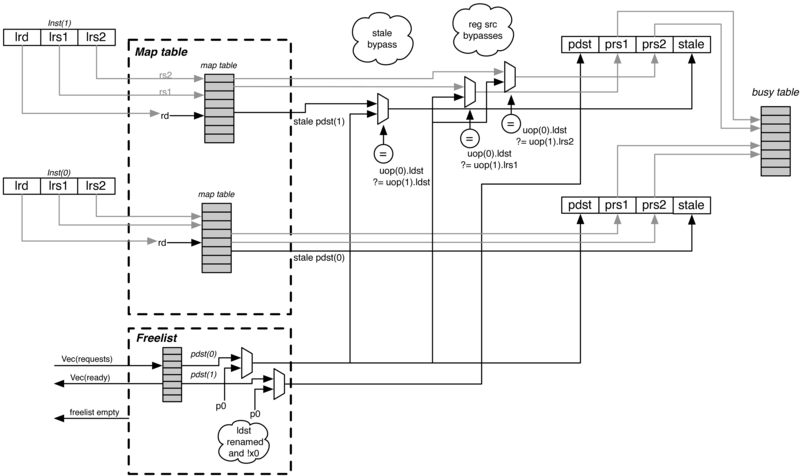 For instructions that will write a register, the Map Table is read to get the stale physical destination specifier (“stale pdst”). Once the instruction commits, the stale pdst is returned to the Free List, as no future instructions will read it. The MIPS R10k, Alpha 21264, Intel Sandy Bridge, and ARM Cortex A15 cores are all example of explicit renaming out-of-order cores. The Pentium 4 and the ARM Cortex A57 are examples of implicit renaming designs. 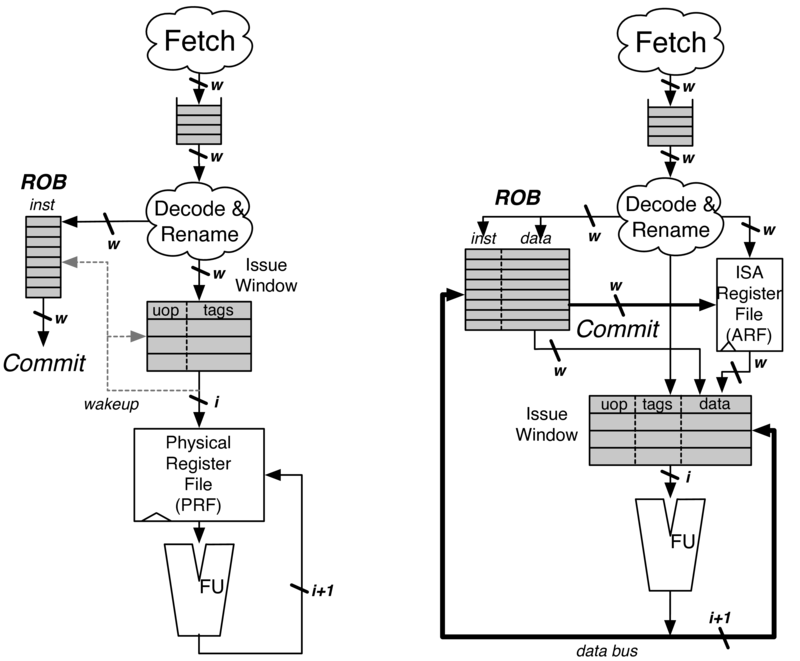 An alternate design for wider pipelines may prefer to only make up to one snapshot per cycle, but this comes with additional complexity to deduce the precise mappings for any given instruction within the Fetch Packet. A two-wide rename stage could use two priority decoders starting from opposite ends.